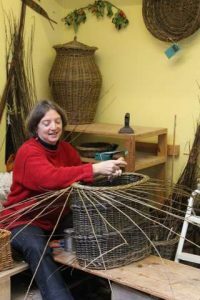 Originally from Dublin and now living in rural Herefordshire, I have been a basketmaker for over 20 years, learning my craft mostly in the West of Ireland, but also from expert basketmakers in England and France. Working mostly with unstripped willow, with its variety of texture and colour, I like to borrow from traditional Celtic and English Regional styles to develop more contemporary designs. Texture is very important in my work. I am inspired by rugged nature, rocks and trees, but also by the way nature renders even ugly things beautiful. I grow much of my own willow in my garden in Herefordshire, supplementing this with willow from the Somerset levels where it has been grown for many generations for the Basketmaking industry. I strongly believe that working with our hands has an immensely beneficial effect, stimulating the problem solving part of our brains. I like my work to be visually pleasing as well as tactile. Being such an ancient craft, with the same techniques being used today as they were thousands of years ago, I feel a connection to our ancestors when I am weaving. I have immense respect for the people who developed the skill of basketmaking and I’m proud to be able to play a small part in carrying on the tradition.